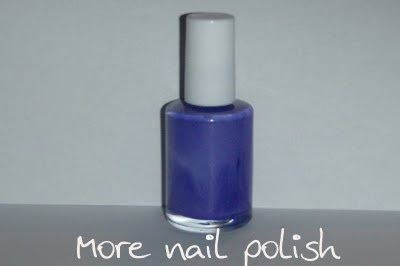 Here the second of the three Mode cosmetics polishes. Despite not being able to get images of Derek Zoolander out of my head now, I want to express what a lovely polish this is. It really does match the blue steel name very well, because it's a blue metal colour, with a light blue shimmer. It reminds me of that blue crusher dust that you compact down with a whacker before laying pavers. It applied very smoothly with no brush lines. This was two coats. YAY fore Mode polish again. Just look at this little beauty! 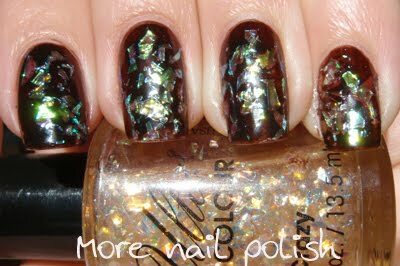 This is 'Glitterati' by Mode Cosmetics. I picked this (and a few others) up from Price Attack - which is actually a hair salon / supplies shop, but they also have a few great brands of polish. 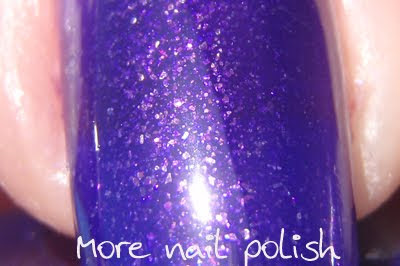 Glitterati is a rich purple jelly, with tiny irregular shaped micro flecks throughout. It applies totally smooth, not rough like a glitter and had a super glossy finish. 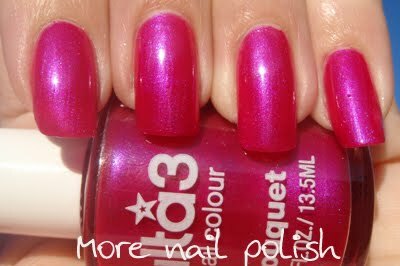 The colour pigment was good, especially for a jelly polish. This was three coats. 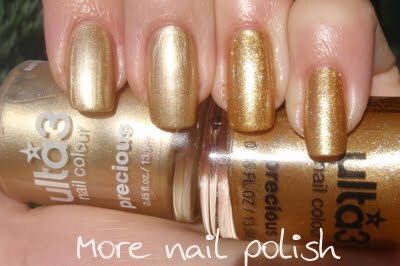 This pic shows a close up of the beautiful sparkly flecks in this polish. 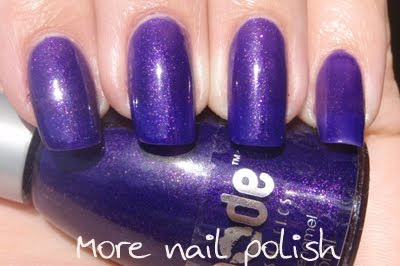 Fabulous polish, awesome finish and a really beautiful purple colour. I love it when you find a really fantastic polish unexpectedly. YAY! This here is my first ever attempt at doing foils. 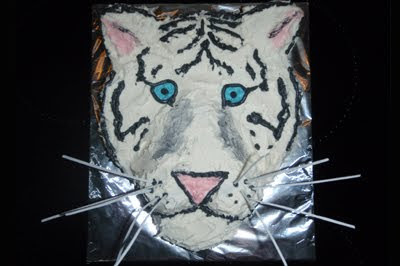 It almost classes as a fail, as it was really bodgy job. Let me explain. First I put on one coat of Ulta3 Snazzle. This gave me a shiny base on which to put my foil, and if I had gaps in the foil, hopefully they wouldn't be too noticeable. 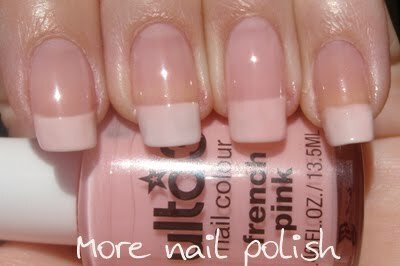 In the end I had a lot of gaps showing my polish beneath. BUT the effect was still good. 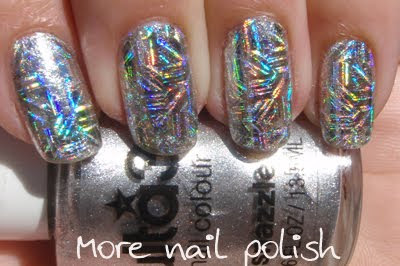 Super super shiny and metallic, with awesome holo madness. 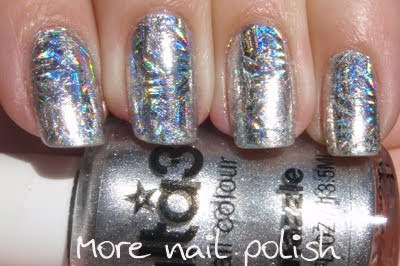 I tilted my nails here to show the holo pattern of the foil. I think this pattern was very forgiving too, it hid a lot of the flaws in my application. 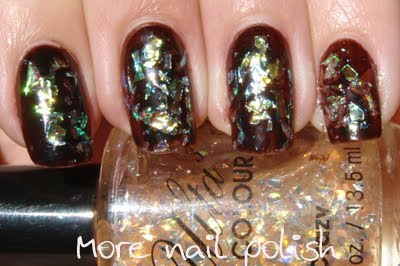 I also read online not to apply a quick dry top coat, as it crinkles up the foil. I listened to this and applied a generic brand top coat I had. I let that dry for about 10 mins and then put on Seche Vite. I saw a little crinkling at first, but it relaxed out as it dried. I bought a sample pack of 25 foil designs, so I will see if my application gets any better with practice. Has anyone else tried foils? Got any more tips for me to get better adhesion? I've said it once and I'll say it again. 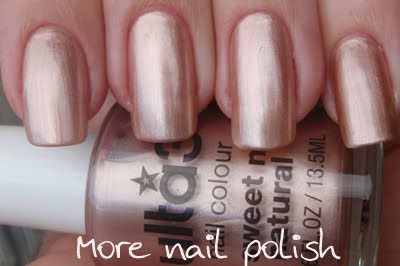 I love metallic polishes. 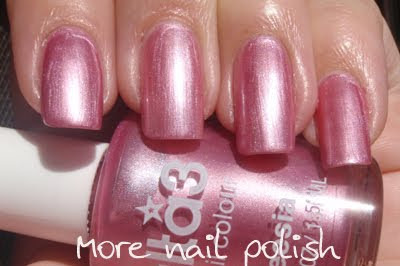 This beautiful polish is BYS Metallic angel. 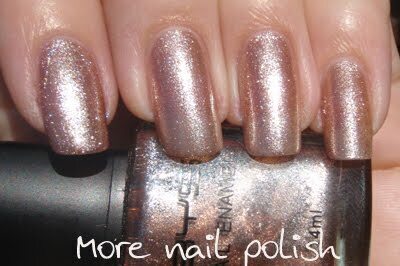 This polish is made up of tiny irregular shaped metallic flecks that are silver and tan in colour. The light reflection on this looks pink, but it's really more of a tan/neutral coloured metallic. It was great to apply, very smooth and even and no streaks. In sunlight this polish is spectacular. Indoors this polish is much more subtle and you can really see the different coloured metallic particles. It was a little sheer, this was three coats, however it dried very fast so many coats is not a problem. Indoors you can still see a slight visible nail line, but in sunlight you can't see anything because of the blinding reflection. 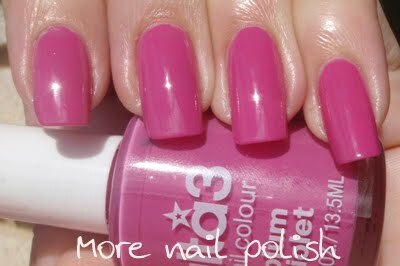 This was my first BYS polish - which is another Australian polish brand. These retail for $4, which is very reasonable for polish here in Australia (where a bottle of OPI costs $20). Very happy with this polish, I actually wore it for about three days! I can see it staying in my regular rotation. 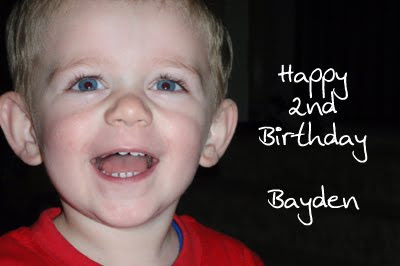 Today I have been flat out preparing food for Bayden's birthday party tomorrow. I finished about 5.30 with the last thing, his cake. We are having an animal party where everyone is dressing as animals. Bayden has a white tiger costume, so I made him a matching cake. During the course of the day I have managed to break two nails :-( My right index finger and my left thumb. At least they are not nails that I photo! And that was after I trimmed my nails down yesterday to a more manageable length. Today I share with you my trimmed naked nails. I try to at least have one night were I don't wear polish to bed, it's my way of letting me nails breath. Finally, the last thing I want to share is that I have put together my Ulta3 colour guide. My guide groups all my swatches together in similar colour groupings. I hope you Aussie girls find it useful. Today I have swatches for you of the 'new' verses 'old' Ulta3 polishes that I have found. I have said this before, but when I say 'old', I say that because the writing on the back of these bottles don't match all the current bottles. However, I have purchased all of these 'old' versions within the last month. I have already swatched most of these with their description, so I won't go into details. Precious - Old on the left, New on the right. I prefer the old version. 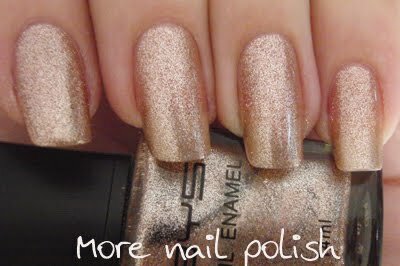 Actually, I would love to have the colour of the old, with the foil finish and sparkles of the new. 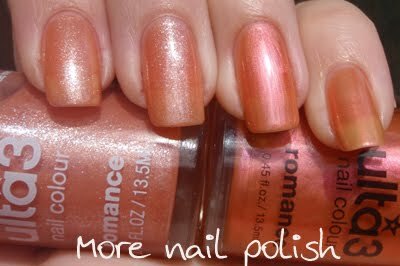 Romance - New on the left, old on the right. They are both similar tones, but the new version has a strong crystal shimmer and the other has more a subtle red shimmer. So I guess it depends if you like sparkly or subtle. I like sparkly, so the new one for me. Both three coats. Pink colada - No comparison here. It's not even worth picking a favourite because they are not even the same animal. Old on the left, new on the right. Three coats of the old one, only one coat of the new one. 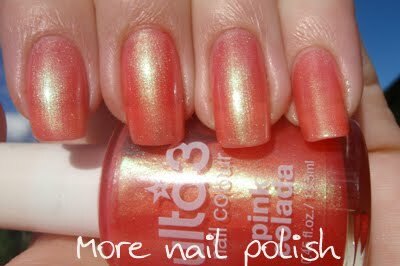 I can't believe that Ulta3 can release a polish with the same name, but make it sooooo different. 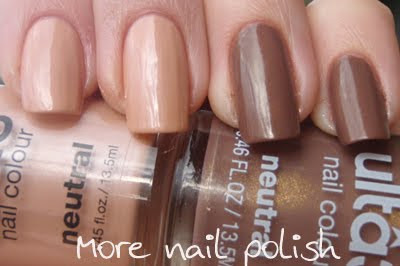 Neutral - Again, not even the same animal here. I like them both. Old on the left, new on the right. 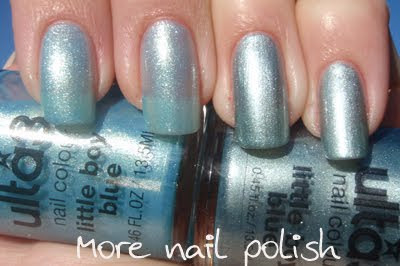 Little boy blue - New on the left, old on the right. Hard to pick my favourite between these two, but I think I have to go with the old version. It's more opaque (2 coats verses 3 coats for the new one) and it has a much better foil finish. Has anyone else seen different versions of ones I don't have listed here? I'm sure there must be others other there. I spent a few hours swatching last weekend and managed to swatch all my Ulta3s. I believe I finally have every colour! Here are the remainders of the red Ulta3 polishes. Fire is a really bright yellow toned red creme. It's so bright you could nearly call it a neon. It was a little sheer but nice and smooth, not gluggy This was three coats and taken in full sunlight. Scarlet is quite similar to fire, it's still a yellow toned red, but this is redder than fire. This was also more opaque than fire, only needing two coats below. Taken in full sunlight. Foxy russset - I love the name, and yes that's three 's's. This is a deep burgundy red with a gold shimmer. Opacity for this was much better than fire. This was two coats and taken in full sunlight. Pepper pot - colour wise this is pretty much a creme version of foxy russset. This was two coats. Pic taken outside, but the sun was behind the clouds. 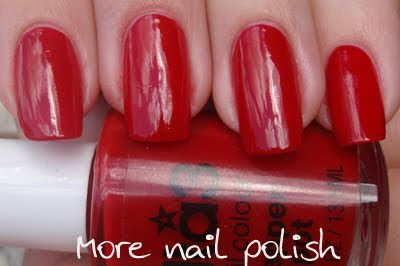 Sizzling red to me is your classic red polish. It's probably more on the blue side than the yellow side of the spectrum and that is how it differs from Scarlet, its bluer. It's a really lovely polish that just glides on. This was two coats and taken in full sunlight. I just had to show a comparison here of sizzling red next to pink colada. They are very similar, with pink colada just having a few more drops of blue in it than sizzling red. 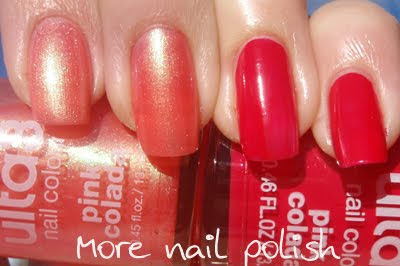 This pic shows sizzling red on the index and ring finger and pink colada on the index and pinky. 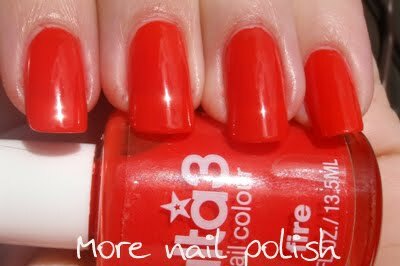 Over all, I think there is a very good range of red colours in the Ulta3 collection. 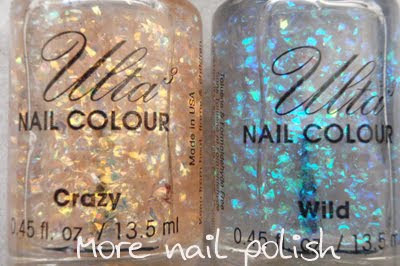 I'm thinking of putting together a full colour guide of all the Ulta3 colours I have (currently 92, which includes a few 'same name, different polish' versions). That way you can see all the colours in one colour group all next to each other. Yes, I think I will do that, after I have posted them all here.